LAS CRUCES, N.M. (April 18)--The mud-slinging masters of dirt modified racing return to the Southern New Mexico Speedway on Friday, Saturday and Sunday, April 20-22, for the Rancho Milagro Short Track Shootout and the one and only stop of the 2018 campaign at the Las Cruces, N.M., oval. Presented by Premier Waste Services, Barnett Harley-Davidson, G3 Fitness, S&S Fishing & Rental and Torco Race Fuels, fans will see the best of the best of both worlds as the blockbuster is both a USMTS national and southern series event. Las Cruces native Johnny Scott sits atop the point standings in both series. In the USMTS Hunt for the Casey's Cup powered by Summit, he clings to a 13-point advantage over Tucson's Jake O'Neil, who captured the most recent victory last weekend in the series debut at the Canyon Speedway Park. Dereck Ramirez of Woodward, Okla.; King of America VIII winner Lucas Schott and two-time USMTS national champion Rodney Sanders fill the other top five positions in this year's fight for the $50,000-to-win USMTS national championship. Stormy Scott, Terry Phillips, Zack VanderBeek, Jake Timm and Logan Robertson complete the top ten. In the Summit USMTS Southern Series powered by Production Jars, Johnny Scott's cushion over Cade Dillard is just two markers while Grant Junghans USMTS Rookie of the Year points leader Ethan Dotson sits third. Sanders, Ramirez, "Big Daddy" Joe Duvall, Bryan Rowland, Carlos Ahumada Jr., Robertson and Zane Ferrell round out the top ten. 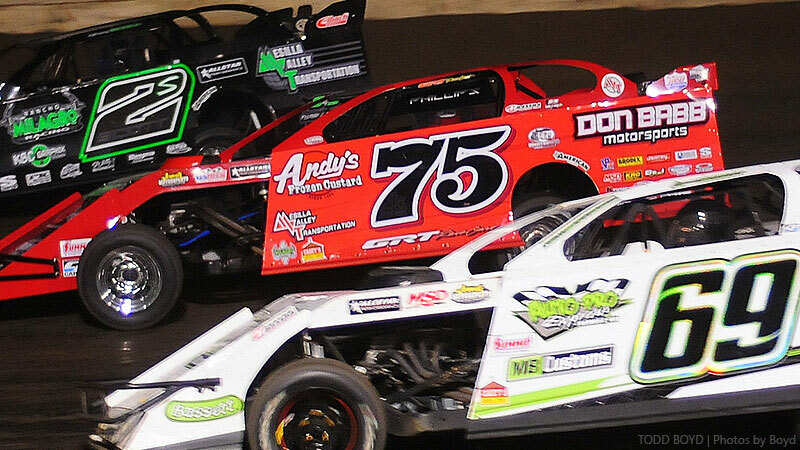 While the USMTS is the pinnacle of the dirt modified world, the Southern New Mexico Speedway has no equal when it comes to local talent capable of stealing the big money. Former USRA Modified national champions Fito Gallardo and his son, Jake Gallardo, of Las Cruces will join Mesilla Park's Bumper Jones and his father, Royal Jones, to take on the high-speed invaders. Other regulars expected include Jon "Catman" Mitchell, Philip Houston, Christy Barnett, Jimmy Ray, Donavon Flores, Dustin Smith, Austin Adams, Terry Tipton, Butch Reid Jr., Max Sadler, Jake Boles, Dr. Tom Georges, Dustin Smith and more. Modifieds will be co-sanctioned by the USRA and will earn Summit USRA Weekly Racing Series national, regional and track points all three nights along with Stock Cars and B-Mods (X-Mods). Current Holley USRA Stock Car national points leader Donavon Flores of Las Cruces and defending Out-Pace USRA B-Mod national champion Ryan Gillmore of Springfield, Mo., are both expected to be on hand.